I’m not sure doing hill repeats 34 hours before speed intervals was the smartest idea I’ve ever had; in fact, my glutes, who I’m thinking are probably still very much annoyed with me, were screaming and cursing at me for hours after. But my mind felt as though it was freed from the negativity of the last few days, and that, my friends, was well worth the gluteus maximus scolding I endured. Oh. And my stats, they have me feeling like a bit of a rockstar! Here’s the breakdown of the intervals: :30; 1:00; 1:30; 2:00; 2:30; 2:30; 2:00; 1:30; 1:00; :30 at 3 km goal pace with a 1:30 walk break in between each. For me, my 3 km goal pace is approximately 4:50 min/km. You will see below just how intensely I annihilated that projected pace. Yes, I am totally gloating! 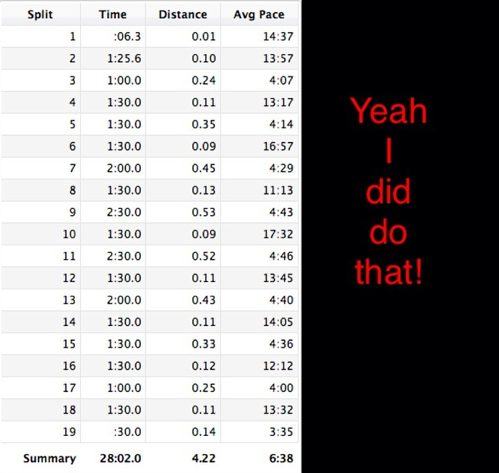 I screwed up the timing for the first 30 second interval, but check out intervals 3, 5, 7, 9, 11, 13, 15, 17, and 19. Not too shabby! Thank you all for your warm wishes and kind thoughts during this tough time for my family and I. It meant an incredible amount. Thank you. 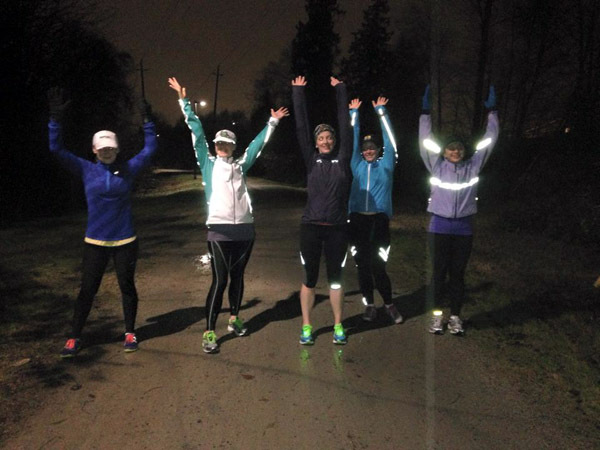 This entry was posted in Running, Training and tagged gluteus maximus, pacing, speed intervals. Bookmark the permalink. No matter how long I do them, hill repeats make me feel horrible while I’m doing them and then make me feel awesome that I got through them.